This past month the U.S. government took a step in the right direction. Three South Sudanese individuals and three related companies were designated for sanctions and barred from accessing the U.S. financial system. In addition, the Treasury Department issued an advisory alerting financial institutions to the risk of corruption stemming from South Sudan, so that transactions from South Sudanese Politically Exposed Persons are subject to additional scrutiny. 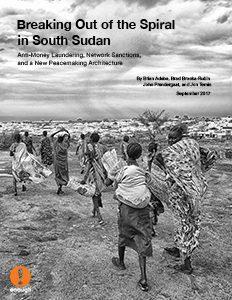 The continued and expanded use of financial tools to build leverage: Financial tools—including network sanctions, sectoral sanctions, and anti-money laundering measures—should continue to be used and expanded to build greater leverage over the South Sudanese government, armed opposition actors, and commercial partners who drive mass violence and hijack state institutions. Such financial measures can ensure that South Sudanese leaders and their networks pay a far greater price for state capture, which in turn can compel them to change their behavior. Limited pressure, such as unenforced sanctions placed on a small number of individuals, by itself, does not build the requisite leverage. Such an approach can undermine the credibility of sanctions as a policy tool. International partners should support and build on the recent U.S. policy measures that recognize this reality. A revised peacemaking architecture and peace approach: The peace process should be reinvigorated, as the current Agreement on the Resolution of Conflict in South Sudan (ARCSS), negotiated by the Intergovernmental Authority on Development (IGAD) and signed in August 2015, is clearly not working. The architecture of peacemaking should be revised, with the African Union and United Nations taking a more direct, hands-on role, in collaboration with IGAD, in a process that includes a broad range of South Sudanese constituents. Such participants can represent a range of different interests and grievances within the population, and not just the narrow interests of government and rebel political and military leaders. The peace process should not only include a broader range of people but also include a broader range of the issues that matter most to South Sudanese people. The peace process should also include opposition leader Riek Machar, who represents a notable constituency and should not be isolated. Click here to read the full report here.